As the song goes, “breaking up is never easy”, yet, according to ABBA’s manager at Polar Music, their records still make over one million sales per year; obviously, that definitely won’t do ABBA any harm! He went on to state that the record is estimated to have sold over 385 million copies, thus making them one of the biggest artists of Universal Music Polar, who is now a part of Universal Music, owns all rights to the ABBA trademark and catalog. ABBA actually sells more records than ever before, despite the splitting up in 1982. ABBA recently announced that it had two recorded singles that it intends to showcase digitally with the four group members performing as holograms - “ABBAtars”. This isn’t a reunion, rather it is just another carefully thought out move in the ever-continuing story of ABBA. You could say this move is every bit about the business as it is about the music itself. Back in 1974, Björn suggested that they put on costumes capable of creating a lasting impression in the minds of people for their Eurovision song contest where they were to represent Sweden for the second time. This was obviously a clever move that was aimed at keeping them relevant in the minds of people even if they failed to win the competition. The band’s manager, Stig Anderson prepared several recording contracts all over Europe. He also traveled to many countries at the time, making sure that all the major radio stations had vinyl copies of the single Waterloo, which they could play if the band successfully bagged the competition. Fortunately, they won and this was their ticket to international stardom. However, their bond, which served as the magic ingredient for this amazing band had significantly faded by 1982. By the end of Bjorn’s and Agnetha’s divorce, Ulvaeus wrote The Winner Takes All. They all decided it was time for everyone to go solo. Perhaps, it was Thank You For The Music and goodbye but a host of tribute bands and ABBA cover versions and films such as Muriel’s Wedding and Priscilla Queen Of The Desert all featured ABBA’s songs and served as the propelling force for the ABBA revival in the 1990s. It was the start of something new, with a new audience. While this was on going, Benny and Bjorn continued collaborating, creating songs for Chess. Then by 1992, the compilation of the ABBA Gold album became one of the best-selling albums of all time. By the time the Musical, Mamma Mia opened in London in 1999, it prompted another business boost. Till today, over 2 decades after, over 8.9 million people have seen it in London. Mamma Mia grossed £699 million, thus bringing the overall global box office figures to about £2 billion. It came as little surprise to many when the Mamma Mia movie, which featured Meryl Streep, broke the records for highest grossing live-action musical film of all time, pulling in over £612 million at the box office. In July 2018, the sequel, Mamma Mia! Here We Go Again, is set to be premiered; Benny and Bjorn are the executive producers. There are 3 other ABBA-related ventures that Bjorn has been involved in of recent through the company Pop House in Sweden, which is partly owned by him. In January 2016, Mamma Mia! The Party was opened in a Greek tavern in Stockholm, offering a variety of acrobatics, spectacular dancing and of course, ABBA music. It has had 500 performance nights since then and has sold out almost all. He ended by stating that plans are still on going and that a new location would be announced soon and by the Autumn of 2018, tickets should be available for the opening scheduled for the Spring of 2019. Every February, when we’ve had just about as much as we can take of the cold days, dark nights and frosty mornings of the UK, Abba Revival jet off to Dubai to grace the stage of one of their most anticipated shows of the year. With February temperatures averaging a glorious 25c, Dubai is home to the worlds tallest man-made structure. The Burj Khalifa stands at a colossal 2,717 feet and is also home to the highest mosque, the highest restaurant, highest outdoor observation area and highest nightclub. The Wafi complex in Dubai, in which the band perform, is comprised of restaurants, a mall, residences and a nightclub, all styled in the stunning architecture of Ancient Egypt. The stage is beautifully dressed with reds and golds for a real romantic Valentine’s Day atmosphere, in fact the band recently revealed that a couple came to see them last year and excitedly said that their 3 month old baby had more than likely been conceived on the night of their performance!! Nothing like a bit of Abba to get you in the mood!! Although Australia is a country with numerous and successful tribute acts. One reason is believed to be that many international artists rarely or never-tried to make the long trip down under, so the audience had to settle for second best if they wanted to hear their favorite songs live. From Australia comes also one of the most successful tribute group Bjorn Again. What started as a pubband in the late 80's is now a successfull franchise with up to five sets Abba clones play worldwide. - "Bjorn Again do not at all the same thing as us. What they are doing is a parody, we think Abba was cool for real", says John Reilly in the present setting on the leather sofa at Glastonbudget. He plays Benny in Revival - The Tribute to Abba, the band that will soon contain two married couples, just like ABBA once did. John (Benny) and Lisa (Anni-Frid) married a long time, while Nina (Agneta) is engaged to one of the drummers who usually go on tour. Marcus (Bjorn) have so far separated from romance for the job. - "What many forget is that Abba was a really good live band, they rocked", says John and scratching his Benny beard . - The guitars are heavier, everything went faster. We think it sounds pretty thin as we listen to the album versions. Abba Revival, among other things occurred in Malta and Sweden, for hundreds of thousands of spectators at Liverpool and at a funeral for a really big Abba fan. The members do not feel threatened by all competition from other bands like Abba acting on the stages. - "No, there is work enough for all of us. I'm in a group chat on Facebook with a bunch of other Agnetor and Frids's, we usually pass on gigs if we are already fully booked", says Nina Clark. Everyone in the group has played in other bands before, and Nina is still trying to write her own songs. - "Though it is difficult to know how my "natural" voice. I used to have a gentler way of singing, but in recent years I have sung more powerful as Agneta, and it has affected me". It is early afternoon when ABBA Revival plays its first gig of the day - then they shall hasten on to another festival. In the audience is a hipster in dungarees next to a middle-aged man dressed as a flamingo, an elderly lady sitting in camping chair in the middle in the audience and sleep with a towel over half his face, while four lads in the football shirts can barely stand on his legs but sing along in full text "Dancing queen". From an early age Frida had a keen interest in fashion and did all her own sewing. She was even known to have styled herself like Jackie Kennedy in the days before ABBA. In 1973 when they entered the Melody Festival with the song ‘Ring Ring’ (the Swedish competition to determine the representative for the Eurovision Song Contest) Bjorn wore a Burgundy jacket with a pink fringe and Benny wore a black jacket, both with a big bow tie. Frida and Agnetha’s clothes were actually made by Frida herself, she wore a bright yellow dress suit with a yellow tied blouse and a yellow belt. Agnetha, who was heavily pregnant at the time chose a loose top with green dots and pink flowers. After the global success of Waterloo the following year, Owe Sandstrom, a Swedish fashion designer, became responsible for producing all of the iconic costumes still loved to this day. On a glorious summers’ evening in July, the sky above Haughley Park Estate in Suffolk was alive with the magnificent sounds of the multi award winning abba tribute band, Abba Revival, accompanied by the British Symphony Orchestra. The audience enjoyed their picnics and prosecco before being wowed by over 2 hours of Abba’s greatest hits. The performance was an eclectic mix of vocal harmonies, piano and guitar solos from Benny and Bjorn and stunning orchestral arrangements with a generous helping of audience participation. The British Symphony Orchestra was founded in 1904 and now comprises of 45 of the countries most talented musicians, lead by its principle conductor, Philip Mackenzie. ......ABBA Revival were up next, introducing some pop into the lineup. ABBA Revival stand out from so many other ABBA tributes, not just because they certainly look the part, but because they really nail the music. ABBA‘s songs are intricate and complex whilst staying pop – and ABBA Revival pull this off where others have failed. The delicate harmonies in songs such as Dancing Queen and Waterloo were perfect, and the leading ladies performed each song beautifully. Pianist John – or ‘Benny’ shone especially in his performance of the well known riffs, and the music had a lovely energy that coaxed the audience into the light-hearted fun of ABBA. Despite the grey clouds overhead, the illuminating performance of ABBA Revival kept the mood bright. 5 Stars! The front cover of The Vistors, ABBA’s final album, has been pored over as much as the lyrics as fans and analysts sought to explore the factors that brought this mighty group to a close. The album was released in the same month that the divorce between Benny and Frida was made final (November 1981), bringing a sharp focus to splits and tensions between the band. On previous album covers, the group members had been positioned closely, especially on the preceding album Super Trouper with the band hemmed in by an adoring crowd. On The Visitors, the individual members may have been in the same room, but they were all very much in their own space. The four members were all at least looking in the same direction but the feel of separation and finality (although no doubt aided with the benefit of hindsight) is written all over the album cover. The cover was shot in the Atelje Studio The backdrop of the room almost becomes the story due to the mood lighting and the spatial awareness between the different members. The front cover was shot in the Atelje Studio in Skansen Park in Stockhom. The painting of Eros by Julie Kronberg is as much of a draw as the band itself, who are all found in the shadows. ABBA had rarely take a back-seat or stood in the shadows for anyone else in their career but it was clear that this album was a step apart. The music was still as wonderfully crafted and melodically charming as any other ABBA record but anyone hoping for bubbly and upbeat pop hits would be left wanting more. The members of ABBA were no longer that type of people and the band was no longer that style of band, although it was still a critically acclaimed with a range of stylish and mature pop songs. The front cover of The Visitors can invoke a number of sad and maybe even unpleasant memories for many fans, let alone the band, but it was the perfect cover for the times, and for the music. Recreating the joyous or positive nature of previous album covers would have jarred with the spirit and tone of the record, sending out a confusing signal for the record buying public. This was a serious album and the divisions between band members were clear to see. It may have been easier for ABBA to try and keep their private lives separate and focus on the music at hand, but the band was too big for that to have occurred. There was huge interest in every movement of the band and Benny and Frida would never have been able to keep their separation and then their new adventures in love from the prying eyes of the press. Political pressures impacted on the album as well - Of course, The Visitors was not solely about the breakdown of the relationship or the band, the early 1980s was a very difficult and at times scary place. There were genuine fears of the Cold War escalating in something with disastrous consequences and the dark lighting and foreboding mood of the cover is reflective of those times. All was not well with the world, or in ABBA’s world, and to have created a cover that would have suggested otherwise would have been wrong. While there was never an official statement about the dissolution of the group, after The Visitors it was hard to see how the group could carry on. The album did post a very large sign-post to the future of Björn Ulvaeus and Benny Andersson though, with the song-writing duo moving into the world of musicals and grander statements. In this regard, there is a classical and theatrical feel to the album cover, all of the individual members playing their role and dealing with heartache and loss in their own way. 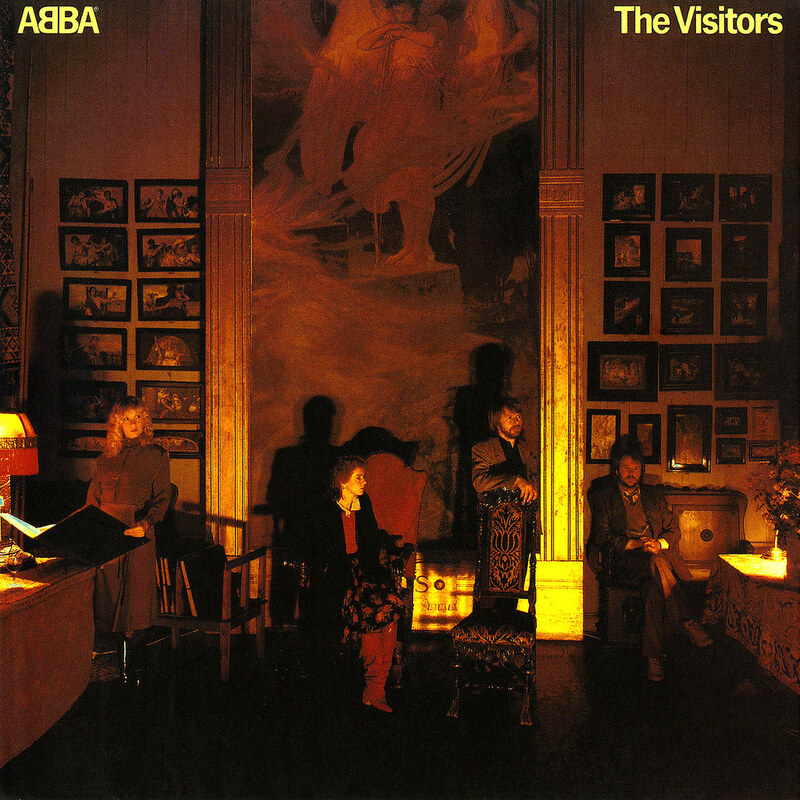 While many people will return to the cheery and uplifting pop of previous albums, The Visitors remains the ABBA album with most substance and interest. Our favourite ABBA front cover features our 4 heroes inside a helicopter - (said chopper is actually a Bell 47, the first helicopter designed specifically for civilian use) presumably at the end of the day with a glorious sunset behind thecameraman. Shot at Barkarby Airfield north-west from Stockholm City. The golden light of the setting sun gently lies across their faces giving softness to the picture. ABBA wanted us to know that they were now big league players, and the helicopter was also symbolic of this. At the time, a music journalist commented that "it was an unfortunate image because ABBA were there on the cover, untouchable, behind glass and ready take off back to their closely guarded private world. They seem to be saying ‘we are removed from you"
Indeed it was in sharp contrast to their previous jolly album covers, and they now seemed to be saying that they wanted to keep a distance between themselves and their public. This album saw the first use of the now famous Swiss style ABBA logo. At this point Abba was huge worldwide and, in a stroke of genius, they came up with this album theme that was reinforced every time they would helicopter into an airport to promote the album. Back to the album, and with greater success came a bigger budget, and the presentation quality of this LP was superb for the time (1976). The cover was a good quality card, while the inner gate fold sleeve, with another great shot of ABBA outside the chopper, was backed with the song lyrics. Quite unusual in those days. UK ABBA TRIBUTE BANDS WINS PRESTIGIOUS AWARD! UK Tribute group "absolutely thrilled"
This is the first time in the history of British Tribute Acts that an award has been established for the Tribute Industry. Each act was judged on criteria like marketing, reality, and production. The award scheme is organised by The Agent’s Association of Great Britain and is the Tribute Industry’s own British Music Awards. Hopefully, the event will become an annual tradition. Abba Revival soared above the stiff competition from 33 other Abba acts based in the UK and ultimately snagged the award.